A very dark and interesting movie, this one is funny at times in an uncomfortable way, but it is also often a little too slow for its own good. A strange and dark movie, this film is about broken and disturbed people who bond together, only to find their troubles actually getting worse. mark schultz is a depressed wrestler living in his brother’s shadow who gets the chance to work for john du pont, a wealthy man from a prestigious family. mark seizes this opportunity up only to learn that dupont is just as awkard and odd as he is. this makes for an interesting friendship, and all seems to be going well until drugs and mark’s brother are introduced into the mix. suddenly dynamics change and a downfall begins. the movie is incredibly interesting, but it also turns out to be kind of slow. that’s intentional, and meant to be artistic, but the film would have been better served by a more gripping structure. the piano music which plays throughout the film, for example, keeps the pace feeling slow. still the characters are deep enough to keep us interested and make for a pretty cool film. Foxcatcher is a strange movie. it’s not strange in it’s structure or style, the way some other movies are (locke and her to name two recent examples), but instead, it’s got the most bizarre set of characters, and that makes it feel pretty unique. this is a movie about troubled people who come together and find connections to each other. it’s about two wrestling brothers who couldn’t be more different, and about how they both go to work for a guy who has the biggest problems of them all. the brothers are mark and david schulz. mark (channing tatum) is a quiet, subdued kind of guy. he’s unhappy and that comes from always living in his brother’s shadow. one of mark’s first scenes has him talking to an auditorium full of kids about winning gold metals at the olympics. none of the kids seem to care. mark doesn’t know how to talk to the kids and how to get people involved in what he has to say. instead he just drones on, not noticing or not caring that he is putting the kids to sleep. it’s a funny scene, but it also says something about this character, and how out of touch with the world he is. when it comes time to get paid for speaking, the person paying mark accidentally writes out the check to his brother. she doesn’t even know his name. that’s when mark makes a comment to the woman about his brother and the movie uses the moment as a transition to introduce us to the guy they’ve been speaking about. mark’s brother, david (played by mark ruffalo), is so very different from mark, that it’s pretty amazing these two guys are brothers at all. david is lively, outgoing, energetic, and fun. where we first meet him, he is entertaining some businessmen in a lit up room overlooking the wrestling mats. mark is practicing moves on the mats. when david steps out and tries to introduce his brother, mark basically puts his head down and doesn’t say a word. to call him socially awkward would be an understatement. but then one day, mark gets an offer to come meet mr. john dupont, a very wealthy man with a well-known family name. dupont lives in a mansion on an estate surrounded by massive amounts of land as well as other buildings on the property. as played by steve carrell, wearing heavy makeup to the point of being almost unrecognizable, dupont is a man who seems to have never grown up. he wants what he wants and will stop at nothing to get it. that includes a tank and gun which he purchases from the army, the nicknames eagle and golden eagle, which he gives to himself, and that fact that he insists on both of the brothers coming to train at his home, and cannot fathom taking no for an answer. mark goes to work for dupont first. the pay is too good to pass up, and also he is intrigued by the potential to make something more of himself than he has been. mark is helicoptered in to meet dupont, and when he agrees to come work for him, dupont isn’t as thrilled as mark expected. still, the boys bond pretty quickly over things like how they both did not have any real friends growing up. for mark, his only friend was his brother. for dupont, his only friend was a boy that his mother paid off. things are going well between these guys for a while. mark even makes a speech, that dupont has written for him, in which mark calls dupont his mentor. dupont decides one night to let mark in on secret. dupont does cocaine, and gets mark to try it too. that’s the beginning of the downfall for the wrestler, and really for both men. after mark starts doing cocaine, dupont kind of loses his fascination with the wrestler. it’s as if he got the guy to do everything he wanted and now there’s nothing left. he needs a new challenge, and so he goes after mark’s brother, trying to recruit him. when mark says he can’t help, dupont slaps mark across the face and calls him an ungrateful ape. that’s the end of their friendship right there. dupont does get dave to come and work for him, only by the time this happens the relationship between mark and dupont has become completely severed. mark really goes downhill, and stops talking. he resembles someone who just got lobotomized, and becomes incredibly depressed. mark resents his brother and begins to think that dupont was using him the whole time just to lure his brother over. this is when mark starts losing matches. things get worse and worse for the characters. the second half of the movie is far more interesting than the first because mark almost becomes scary in the way he has transformed to this sort of zombie state. it all builds up to some final moments that are truly haunting. the events that occur get pretty ugly, even if you know what’s coming. i love that the movie tries to offer up a reason for what happened, showing us dupont watching a video of how close mark and he used to be before going back outside. 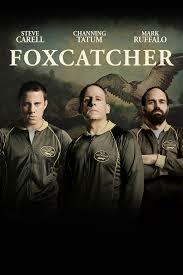 foxcatcher is dark and disturbing. it is certainly interesting, but it also moves very slowly and doesn’t seem to care. there is soft piano music that plays lightly throughout the film and keeps the tone very slow and old fashioned. the music works as a disadvantage to the film, taking moments that should be exciting and making them feel more subdued. it’s a good movie, but it definitely needs a little more life. especially in the middle. the performances and story are all terrific. the pacing, however, i s definitely too solw. hink that dupont was using him the whole time just to lure his brother over. this is when mark starts losing matches. things get worse and worse for the characters. the second half of the movie is far more interesting than the first because mark almost becomes scary in the way he has transformed to this sort of zombie state. it all builds up to some final moments that are truly haunting. the events that occur get pretty ugly, even if you know what’s coming. i love that the movie tries to offer up a reason for what happened, showing us dupont watching a video of how close mark and he used to be before going back outside. 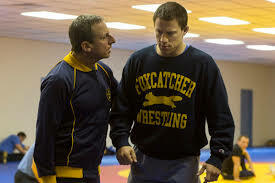 foxcatcher is dark and disturbing. it is certainly interesting, but it also moves very slowly and doesn’t seem to care. there is soft piano music that plays lightly throughout the film and keeps the tone very slow and old fashioned. the music works as a disadvantage to the film, taking moments that should be exciting and making them feel more subdued. it’s a good movie, but it definitely needs a little more life. especially in the middle. the performances and story are all terrific. the pacing, however, i s definitely too solw.